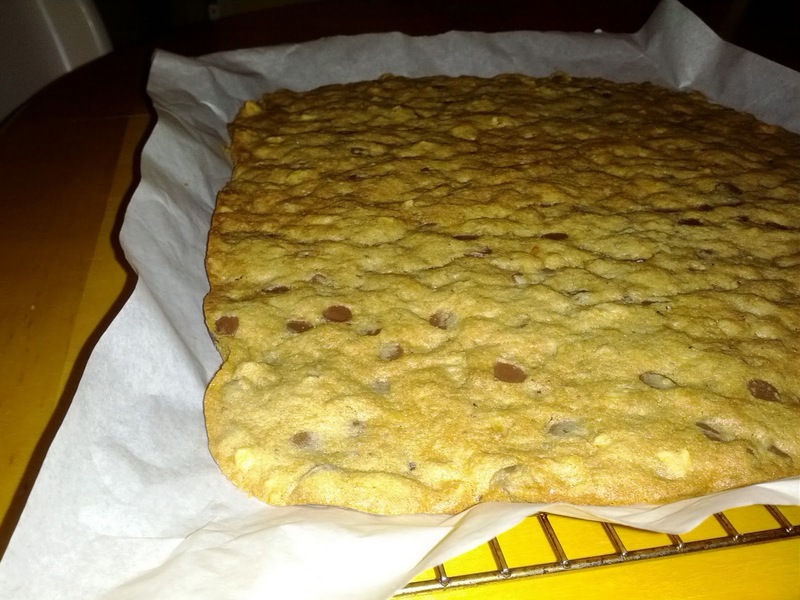 This is a recipe that I spent a lot of time tweaking and modifying over my years working as a pastry chef, and the end result is a cookie recipe that I believe is one of the best. For me this process highlighted the difference between working as a pastry chef and cooking at home - it wasn't about having a great recipe (although that helps) it's about understanding the many cause and effect relationships that are going on when you bake. One lovely sheet of cookie goodness. All of the ingredients for part A must be at room temperature. Mix them in a stand mixer until smooth. Next mix in the four in part B and mix just until well incorporated (over mixing from here on out will make the cookies though). Next mix the nuts and chocolate in part C just until they are evenly distributed. Next bake them until they are GBD (Golden Brown Delicious). I expect that there are quite a few people that are more than a little disappointed that I did not tell you exactly how long I bake cookies to get that warm chewy center with the outer ring of just slightly crispy goodness. Just like our buddy HAL said, "I am sorry Dave, I just can't do that," but I can talk a little bit about why I can't. You see not only do each and every one of you have you own preconceived notion of the perfect doneness for a cookie, you each have ovens with varying degrees of temperature accuracy, ranges, and evenness. The first time you cook these just assume that you will be hovering over the oven checking them often. If you are smart (and you must be if you have read this far) then you will keep track of the time on a printed copy of this recipe and soon that can be your guide although you will always have to adjust the last few minutes due to variations in the ingredients and weather. I always start with 350 5x5 (5 minutes, rotate, 5 minutes) for a standard gas oven and 325 3x3 for a commercial convection oven. A lot of what I learned for this recipe and the base I modified came from the fabulous CookWise by Shirley O. Corriher (highly recommended) - she also has a newer book out that I have not used yet called BakeWise. Here are some of the things I keep in mind. If you have had and liked my cookies then by all means follow the recipe (let me know if you have any problems), but the biggest takeaway from this should be a willingness to adjust a recipe to your liking. Having the right resources can make this much easier, and I plan to devote a few pages to the references and sources I find handy.